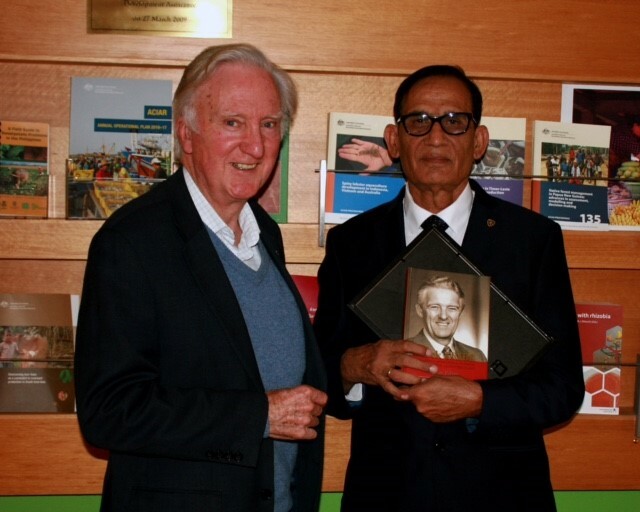 A series of addresses were held in Australia in September by the 2015 Derek Tribe Award recipient: Dr R. K. Malik, a Senior Agronomist with CIMMYT’s Sustainable Intensification Program based in Bihar, India. 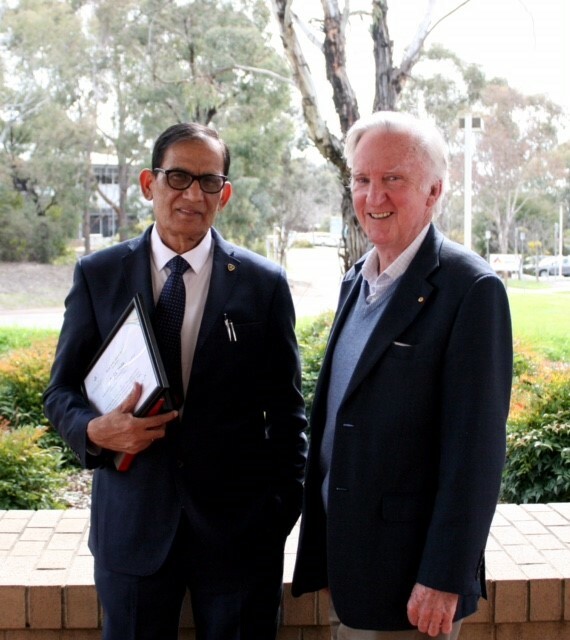 Dr Malik made the official Derek Tribe Award address to an esteemed international audience including the A-C-I-A-R Policy Advisory Council, Commission for International Agricultural Research, and other invited guests on Monday, 20 September in Canberra. The title of his address was ‘Progress and Prospects of the Rice-Wheat Cropping System in the Indo-Gangetic Plains since the Green Revolution’. 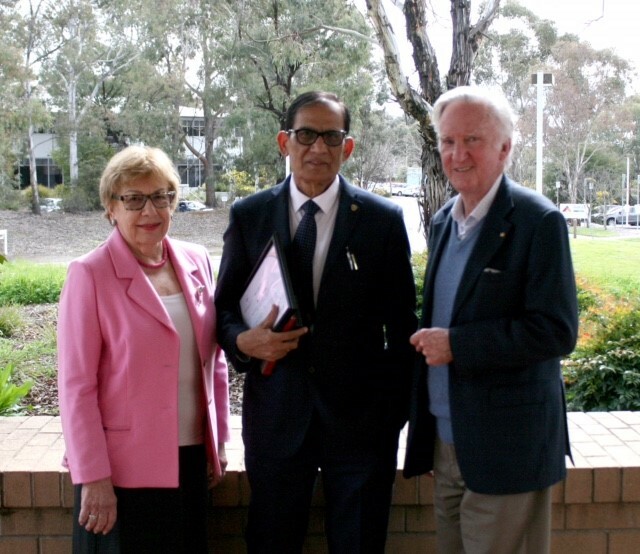 Dr Malik was also presented with the Derek Tribe Award medal by the Fund’s Chief Executive, Dr Denis Blight, and congratulated by Crawford Fund Board member, The Honorable Margaret Reid AO. 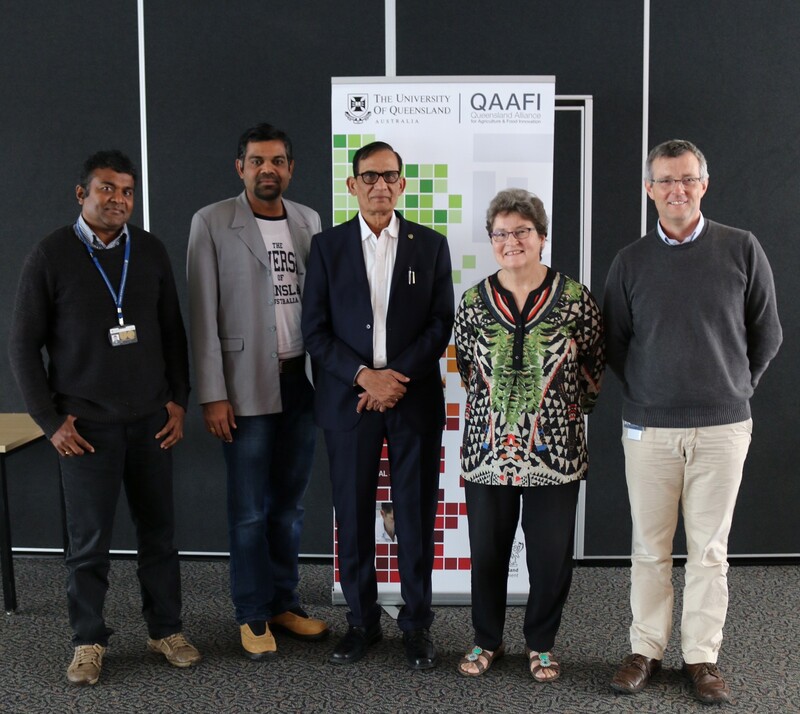 QAAFI seminar: Dr Sudheesh Manalil, QAAFI Research Fellow; Dr Bhagirath Chauhan, QAAFI Principal Research Fellow; Dr Ram K. Malik, CIMMYT; Janet Lawrence, Crawford Fund Qld State Committee , Dr Daniel Rodriquez, QAAFI Principal Research Fellow. During his visit, Dr Malik visited Western Australian, South Australia and made further presentations at Charles Sturt University in NSW (11am, 21 September), in Canberra again (9am, 22 September), and at QAAFI in Brisbane on 23 September. A copy of Dr Malik’s presentation is available here. For further details, contact Tony Fischer, the Fund’s ACT coordinator (phone 02 6246 5244 or 0466 559 223). For any media inquiries, please contact Cathy Reade (phone 0413 575 934).